Your Next Stamp Feature Day-Christmas in July! Hello! It's July Feature Day on the Your Next Stamp Blog and this month is all about Christmas in July! 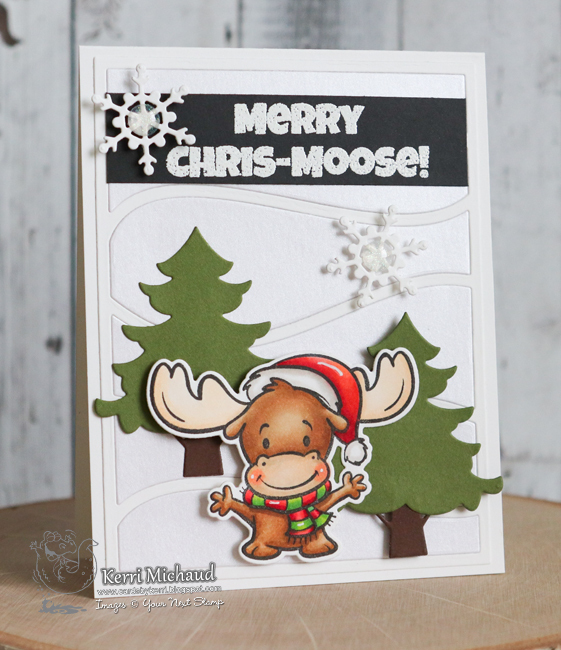 I used the adorable Merry Chris-Moose Stamp Set for my image, and for the background I used the Wave Panel Die Set along with the Tree Trio Die Set. I cut the "frame" of the Wave Panel Die Set out of some white cs and then inserted the panels cut out some shimmer white cs. I heat embossed the sentiment and added some snowflakes with sparkle gumdrop centers using Crystal Clear and Sparkle Gumdrops. You can check out all of the Christmas in July projects on the Your Next Stamp Blog, and make sure you leave a comment for your chance to win a stamp set of your choice!!! Comment must be left by July 24th at midnight EST and the winner will be announced on July 26th! Thanks for stopping by today and enjoy the rest of your weekend! Love your card! Great design and I love how you coloured the moose! I love this little guy, it was such a great stamp that I had to have it for myself too! LOL! Love the scene that you created.